Massachusetts: Ense petit placidam sub libertate quietem. The only state whose name ends in three consecutive consonants, the Commonwealth of Massachusetts, or "Taxachusetts" as some call it, is the liberal capital of the East Coast. Well, if your state had all these Kennedys running around all over the place, yours would be too. 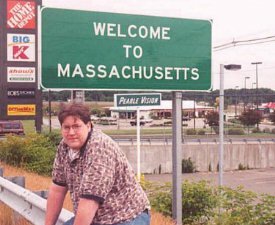 This welcome sign on US-1A in South Attleboro, just across the border from Pawtucket, Rhode Island, is very uneventful. White on highway green, no images, no slogans, no Governor's name. Yes, this isn't an Interstate. But it is a fairly busy route from what I could tell, what with Pawtucket being the home of the Red Sox' minor league affiliate and the New England Patriots just up the road in Foxboro. Of the first 25 pictures that I have taken, I am considering retaking 9. This is one of them. There is a much better specimen on the Connecticut border on I-84. This picture wasn't shot at a particularly good angle. But there's a good reason for that. My best friend Vanya and I were walking around Boston when I saw the Massachusetts State Capitol. "Hey Vanya," I said. "Take my picture. I think I'm going to take pictures of myself in front of all 50 state capitols." 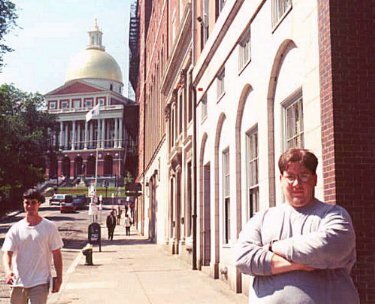 And thus Project 50 was launched in Boston, Massachusetts, on June 18, 1999. I only wish I had thought of it six months earlier since I was out in Wisconsin on a business trip and drove past the state capitol in Madison on the way to our hotel, because I don't think I'm going to be out that way again anytime soon. And that really gets to the heart of what's nagging me about this quest. In pursuing my dream of becoming a sportscaster, I was all set to go to the 1999 Baseball Winter Meetings in Anaheim, California. But at the last minute, I decided to hold off and attend broadcasting school instead. I was all set; in fact, I even had my check signed. I had my entire route planned, I was going to go through about 24 states, optimizing it for maximum signs and capitols while trying to keep it relatively direct. I had planned on getting about 40 pictures on that trip. I'm jealous of friends who have driven cross country. And I'm sure you might be thinking, "Why go to all the trouble for this stupid project if it could take years and years for you to finish it, especially since there was that kid who mowed the lawns of all 50 state capitols in a few months to raise awareness for whateveritwas?" And I don't have an answer. Maybe it's to motivate me. That little kid did all 50 in a few months. I just want to pop in front of all 50 for about 1/500 of a second. If he can do it, dammit, so can I! Anyway, back to Boston. Since this picture was spur-of-the-moment, I didn't take that much time to take a close look at the Massachusetts capitol. This is another picture I will retake, and when I do, I will take better notes. But this is the picture that started it all. This page loaded in 29.892 milliseconds.